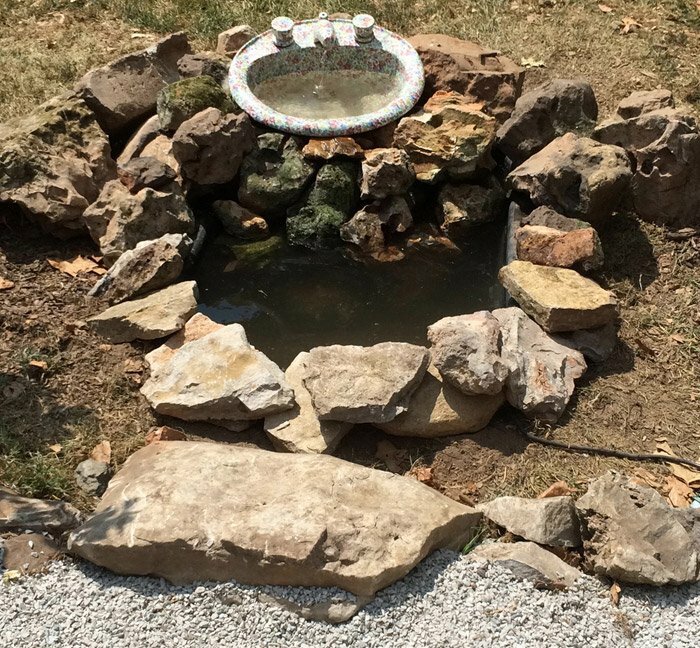 My good friend Merre has been hunting for a fun focal point for a new water feature all summer. 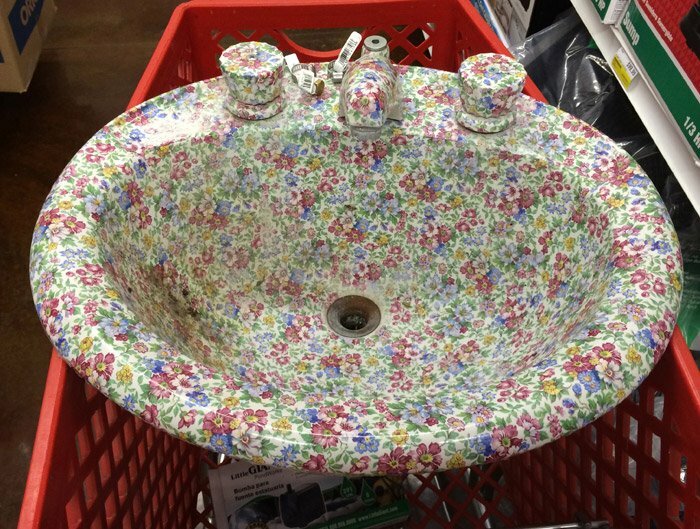 When she discovered this sink at a second-hand shop, she fell in love with it’s quirky finish! And apparently, I have gained a reputation for garden fountain creativity, so I got to help her out with the setup for this project. 1. A two-handle faucet is basically a Y shaped pipe configuration with water entering at the two top arms of the Y (under each handle) and exiting out the spigot. In order to plumb the faucet to one water source, we needed to cap off the fitting under one of the handles. 2. Sufficient adapters needed to be installed to convert the standard plumping inlet to work with a pond fountain. At the hardware store with our sink! For both of these reasons, we just decided to toss the sink in the car and take it for a trip to the hardware store! 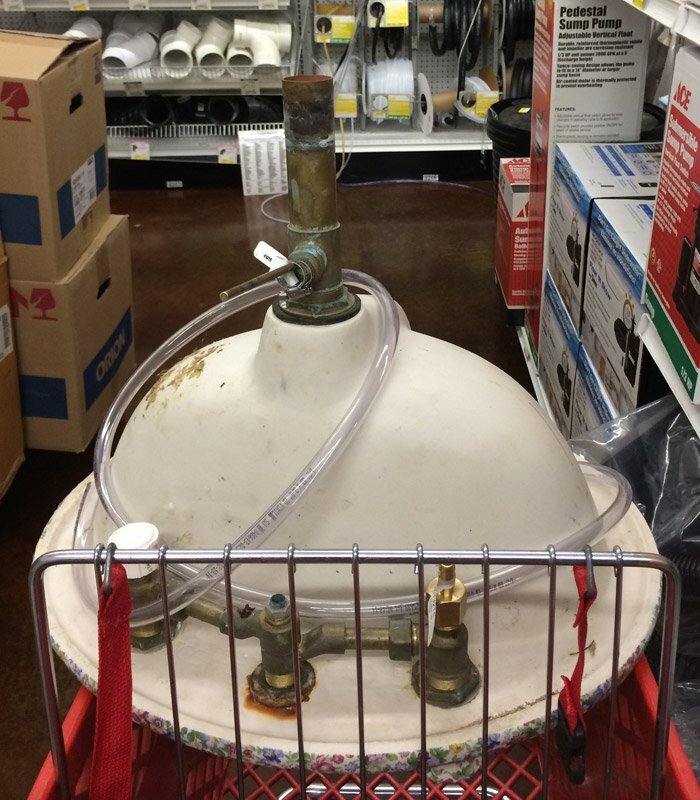 We took it to our local Ace (I love small hardware stores for these projects where you really need the attention of a knowledgeable employee!) 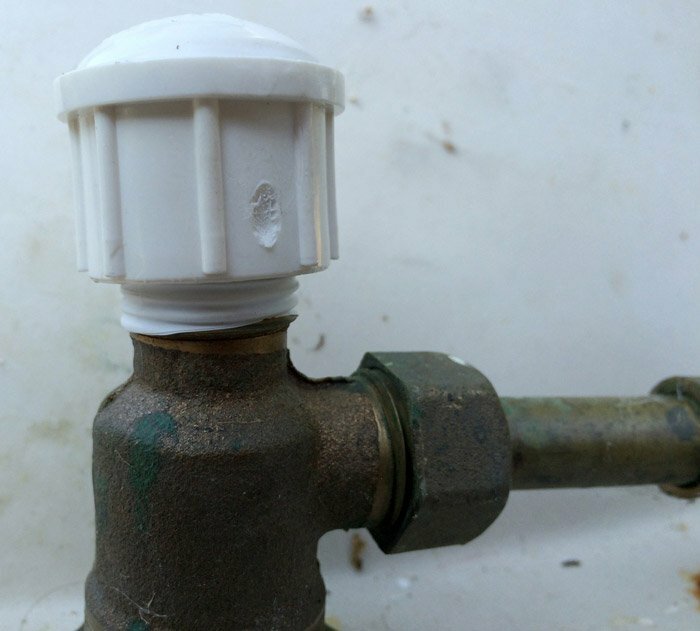 Within 5 minutes they had us set up with a perfect cap for the outlet and the couplers needed to convert the facet to run on the narrow tubing used by garden pumps. A faucet has several inlets, which become potential outlets if not capped. For this sink, with three inlets, we needed 2 caps and one converter (far right) to allow us to attach standard 1/2″ ID fountain hose. 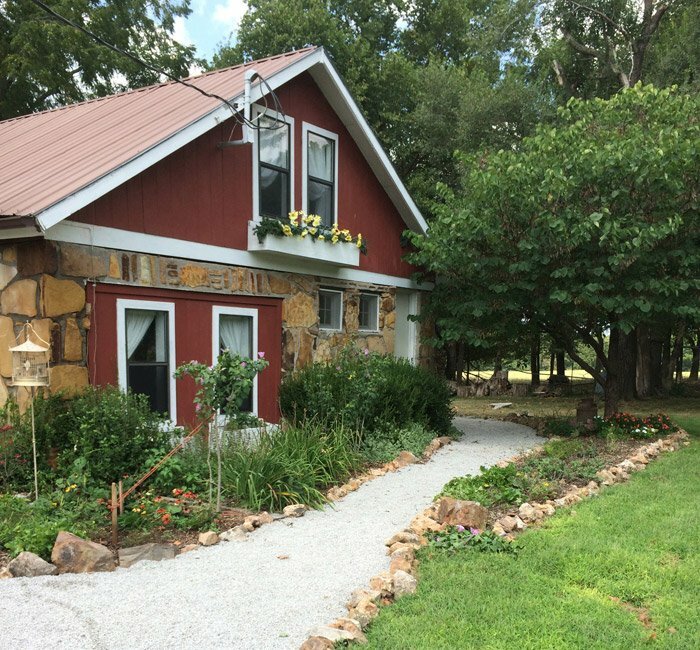 Once we had all our supplies, Merre gathered up some young men to dig the hole and gather rocks, found a trough to work as the basin, and we set to work creating a fun patio water feature for her Air B & B Cottage in Carthage, MO. 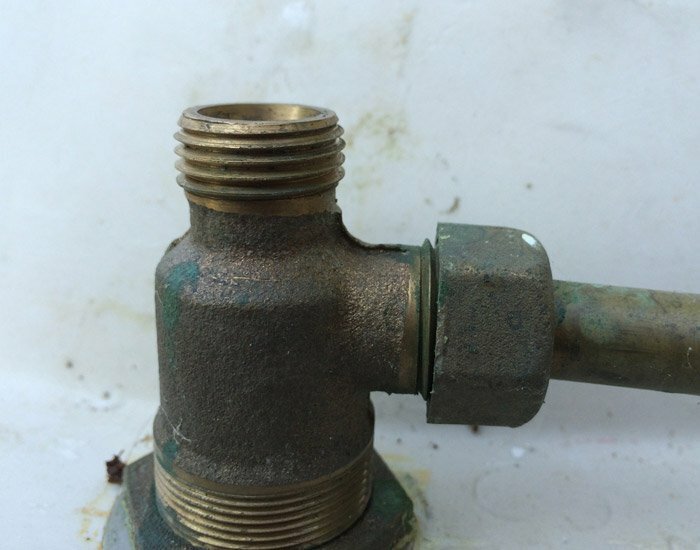 This threaded pipe originally served as an inlet for hot or cold water, we need to cap it to prevent it from becoming an outlet when water enters under the opposite handle. Before adding the cap, I wrap the threads with teflon tape, which prevents leaks. Always wrap your tape clockwise (which I am not doing in this photo! Whoops!) So tightening the cap will not unwrap the tape. Next I screw on the cap and handtighten it, then crank it a few times with a wrench to prevent leaks. 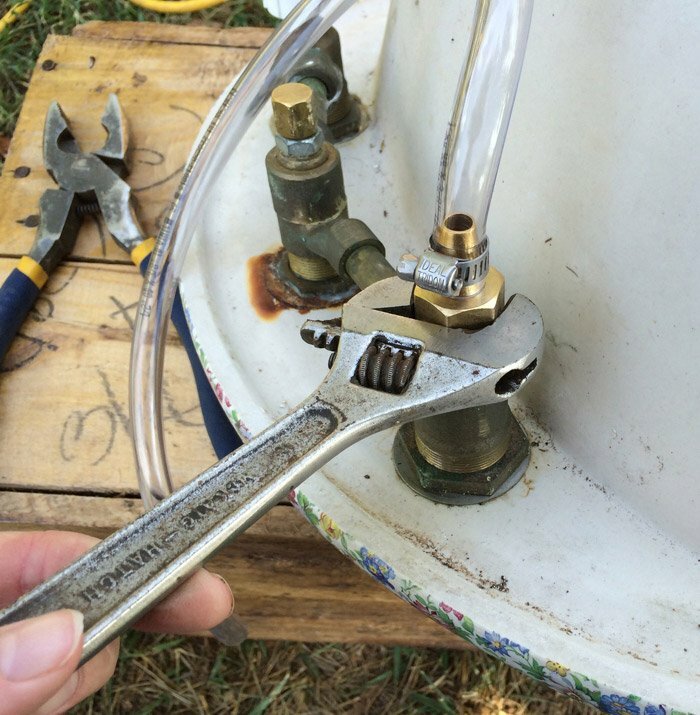 Now it’s time to connect the faucet to the pump via a tube for water. It’s best to use BLACK tube if you can find the right diameter. (Black tubes will not grow algae inside the tube.) Attach tube to barb and secure with a hose clamp as shown. Here’s a photo of the underside of our sink, with the faucet plumbing totally converted and ready to be connected to a water feature pump. 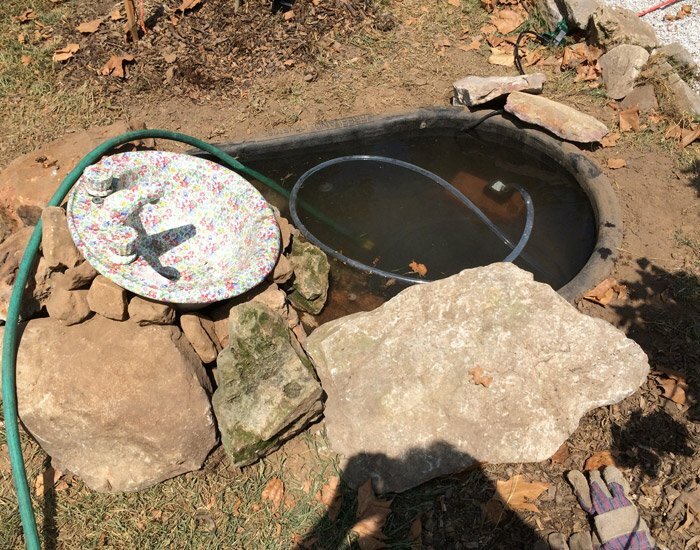 IMPORTANT, after connecting to your pump and before placing in pond, submerge your pump in a bucket of water and give your sink a trial run. Be sure the faucet handles are turned to their fully open position. And just like that, our hole for the in-ground water reservoir for the garden fountain was ready! 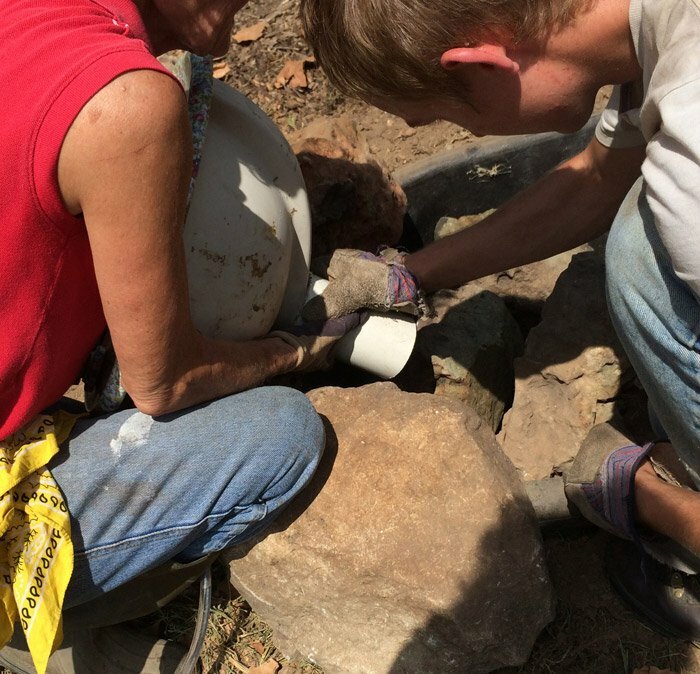 We then leveled the trough, and started moving large rocks to work as a foundation/riser for our sink. 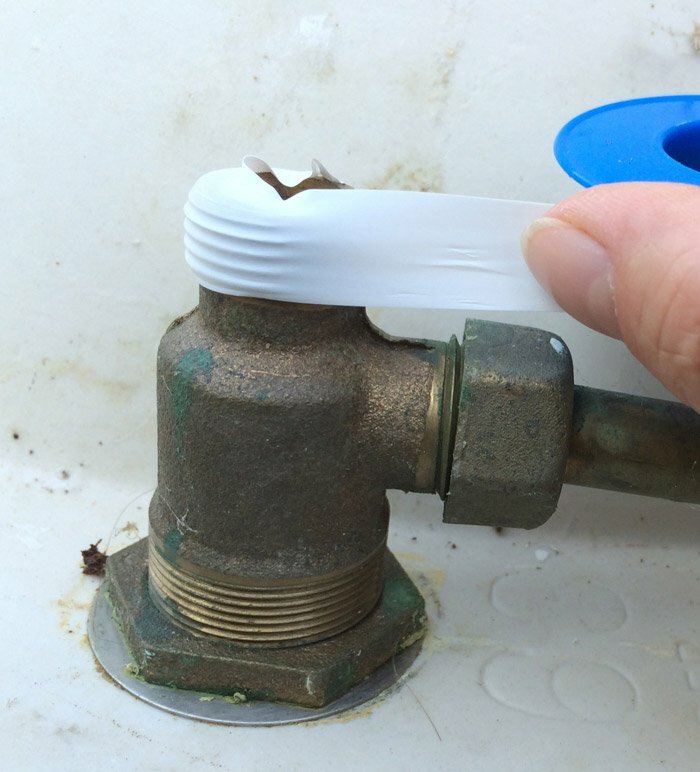 We left the drainpipe attached to the sink, but cut a length of PVC to place the drainpipe inside of. 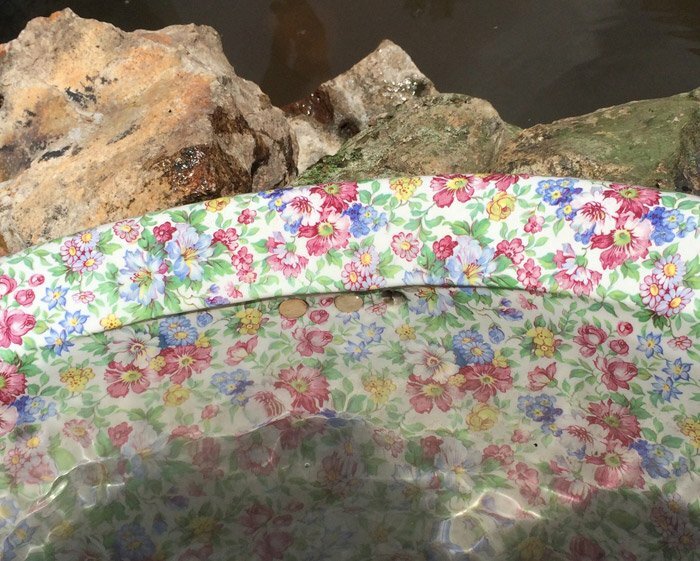 The sleeve for the drainpipe will ensure that if the sink needs to be lifted for maintenance, the rocks will not collapse into the gap left by the pipe. 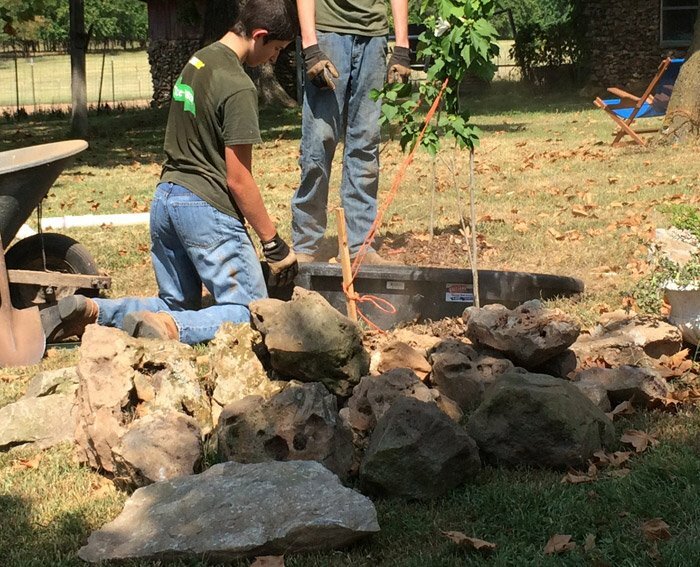 We then gradually began adding rocks to support and conceal the underside of the sink. Overflow or Drain? 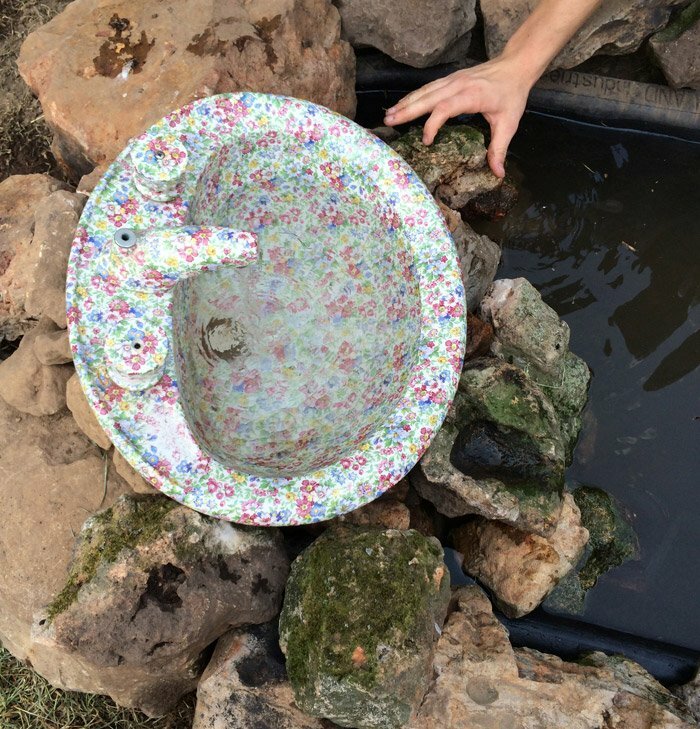 As we built this fountain out of a sink, we realized we could either allow the sink to drain through the bottom, or we could block the drain, tilt the sink slightly forward, and let the sink overflow. 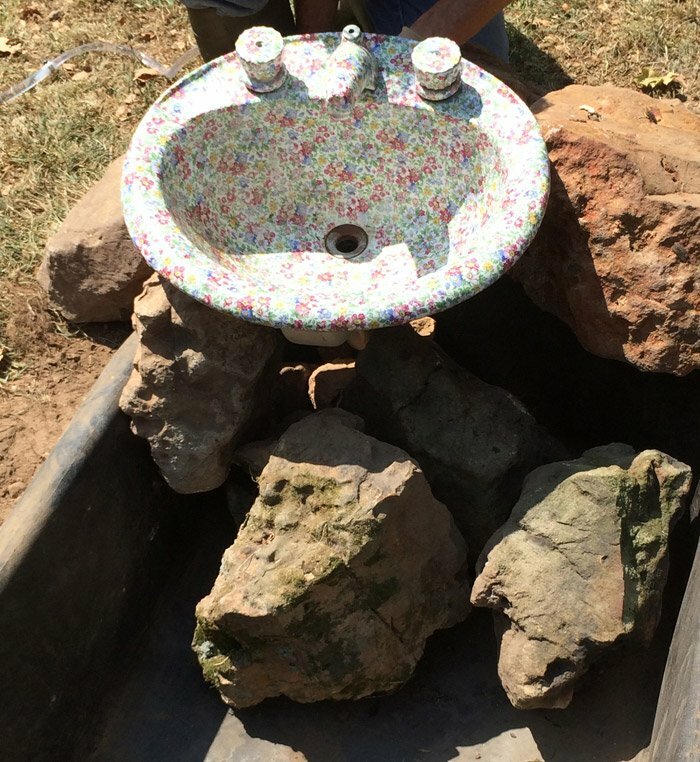 We picked the latter, to increase the volume of the fountain, so we maintained a slight tilt as we finished arranging rocks. Plugging sink overflow drain holes with corks. Our sink was missing it’s stopper when Merre found it at the flea market, but we decided it would have looked strange with the stopper lifted anyway, so a basic stopper (fitted on our hardware trip) did the trick nicely. Sink in place? Drain plugged? 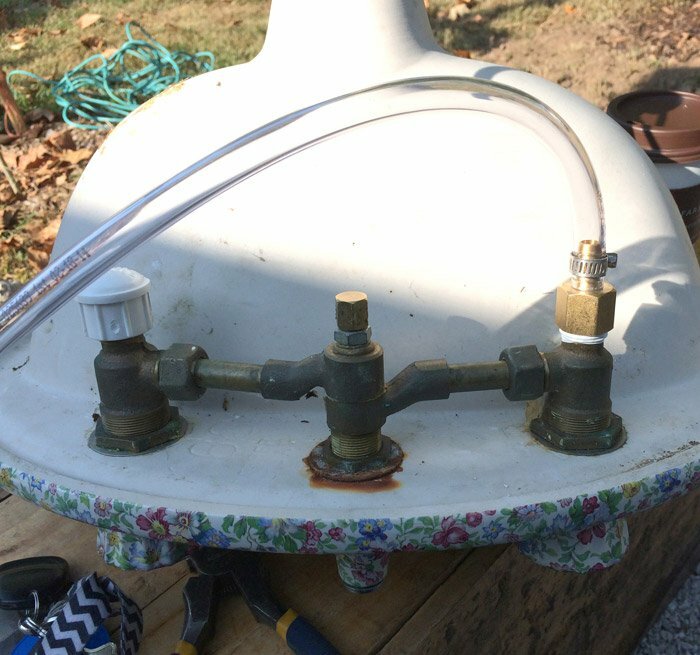 Fountain Plumbed to Faucet? Time to fill ‘er up! Filling our pond. An excess amount of tube was used in order to allow flexibility during construction. As a final step the excess tubing was cut and removed. 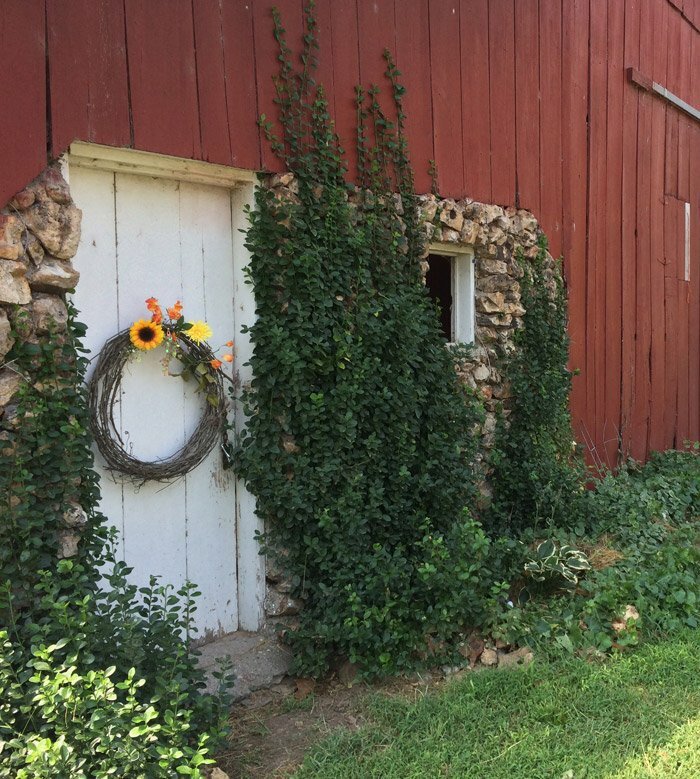 This was a fun project, and was a perfect way to add interest to the back patio at Merre’s Air B & B cottage. 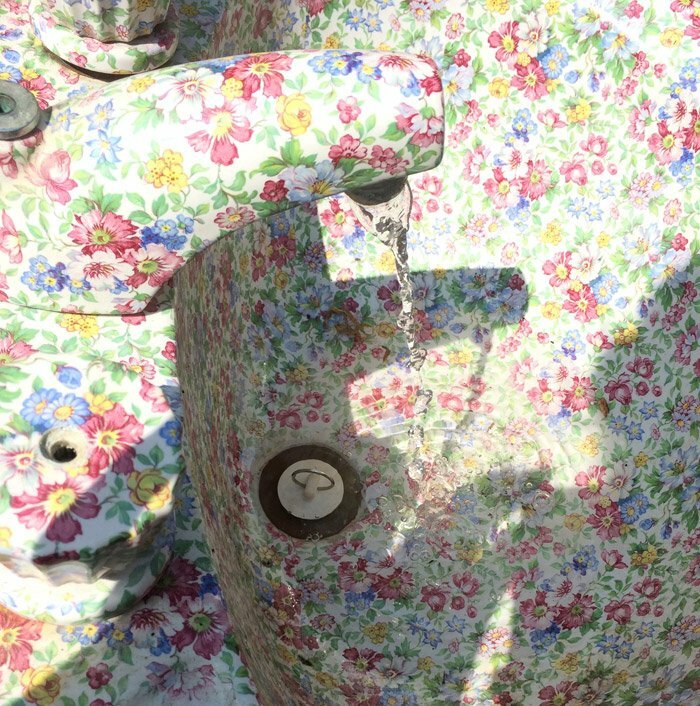 I can think of so many ways to turn a cool old farmhouse sink or apron sink into a rustic and creative garden fountain. 1. 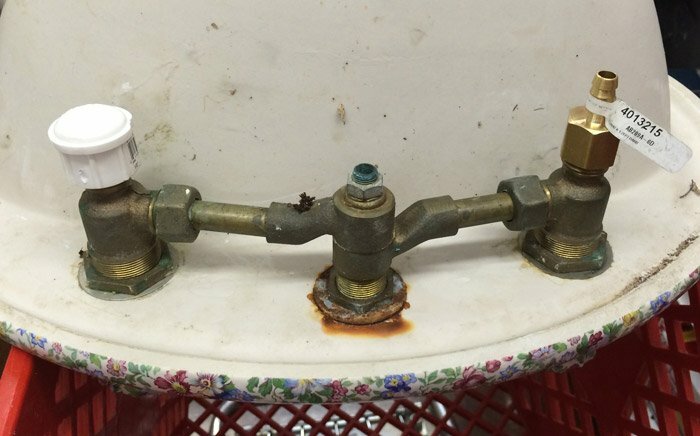 Take your sink and your fountain pump to the hardware store to be sure you purchase the correct fittings. (Note: never buy a pump at a hardware store or big box store- they are about 60% less online! I use and love this $14 120 gph pump from Amazon for most small fountains without much lift. 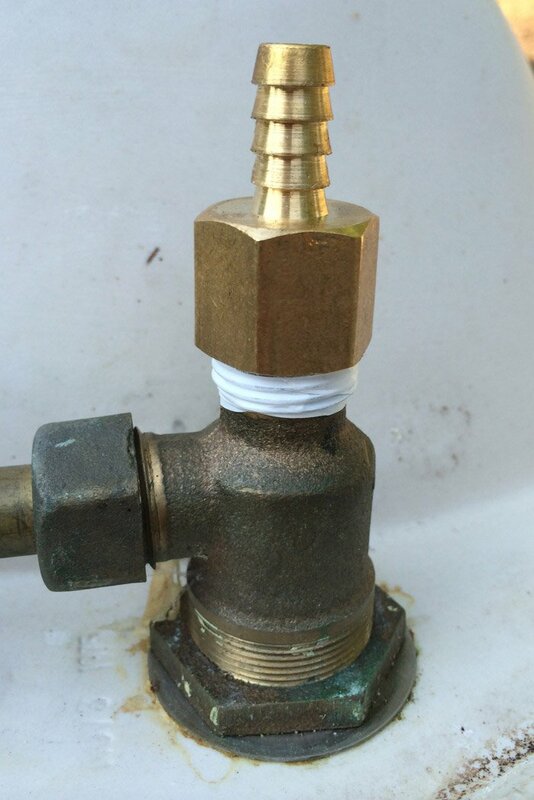 A coupler for the 1 remaining inlet, that will connect your faucet to a tube that will connect to your fountain pump. 2 (buy 3-4 just in case) small hoseclamps. 4. 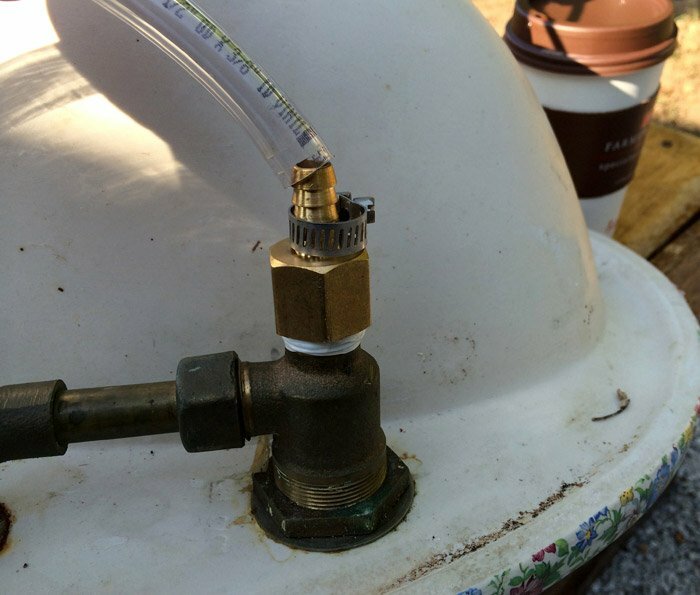 Connect sink faucet (via barbed coupler) to fountain pump with flexible tubing. 5. Test pump/sink by placing pump in a bucket of water and confirming water flows from faucet. 6. Close/plug sink’s drain and plug overflow drain holes. 9. Power on, following instructions included with your pump to maintain electrical safety around water. Did you try this method? 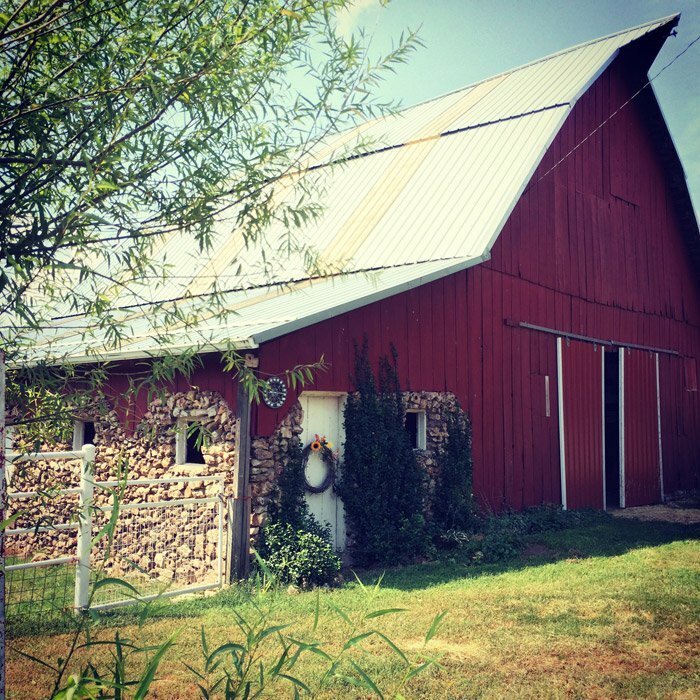 Have photos to share? 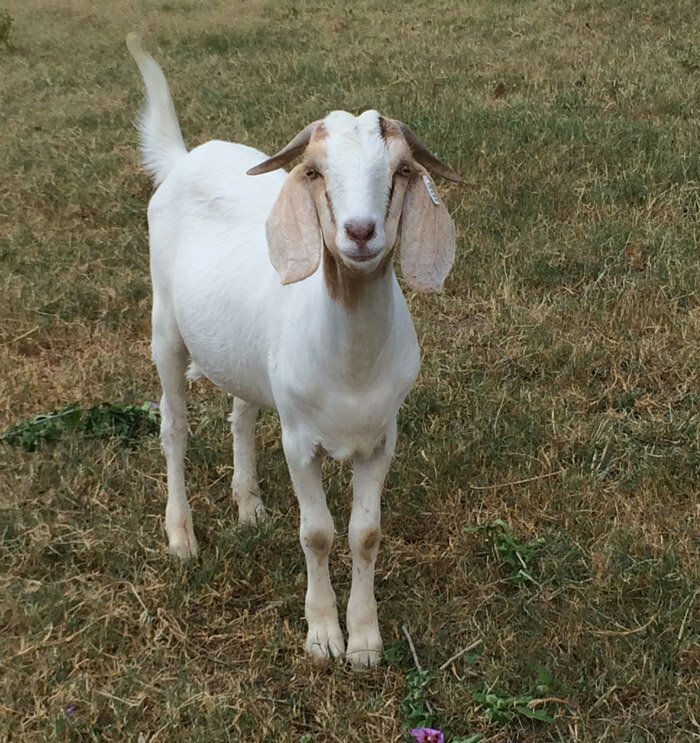 Want to see more goat photos? If so, post a comment below!